Sontronics have had great success building mics for specific applications — but their new flagship is designed to take almost anything you can throw at it. Some would say, without hesitation, that of course the better components would yield a better result, and even express surprise that Coley would even ask himself the question. But it’s worth remembering that, historically, not only have some of the finest-sounding and most highly prized professional audio products incorporated components that could, on paper, be considered less-than-premium, but also that Coley himself had managed to deliver one of them in the form of the Aria, without resorting to the nth degree of component sourcing. As it happens, in the final analysis, he did identify significant performance gains through these experiments, and the concept of the Mercury was born. The microphone is predominantly made here in the UK — while some of the metalwork is manufactured by Sontronics’ partners in China, the electronics are all domestic, and the product is assembled here, at the company’s facilities in Dorset. Referring back to premium electronics for a moment, Coley tells me, “There are three capacitors that are absolutely critical to the audio path: a polystyrene capacitor, and two silver mica capacitors. All have one percent tolerance. They’re as good as you can get.” While he remains understandably tight-lipped about exactly who supplies them, he will say that they’re also of UK manufacture. The machined brass body features the familiar bold, screened logo, making it clear which side of the mic is which. The microphone weighs in at a reassuring but not outlandish 2317g and measures 250 x 90 x 80mm. It comes in a velvet-lined wooden box, which sits in a foam-lined aluminium road case, the various sections of which snugly enclose the power supply unit, shockmount, eight-pin audio cable and the power cable. This selection of accessories, robust and functional if not especially beautiful, will be familiar to any Aria devotee, with the exception of the larger shockmount and the addition of the continuously variable rotary polar-pattern selector on the front panel of the PSU. Also on that panel are a -10dB pad switch, and a 75Hz high-pass filter switch. Further technical specifications are as follows: frequency response is 20Hz-20kHz; sensitivity is 18mV/Pa, or -33dB ±1.5dB (0dB = 1V/Pa at 1kHz); impedance is ≤200Ω; equivalent noise level is <12dB (A-weighted); and maximum SPL (for 0.5 percent THD at 1kHz) is 125dB (more on headroom later). As mentioned above, this is not simply a premium reinvention of the Aria design, with the addition of a few bells and whistles. 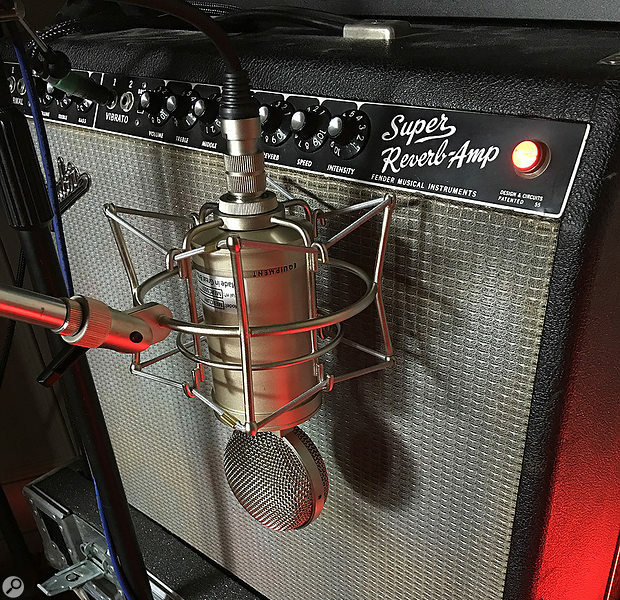 Sontronics often voice their products in an application-specific way — the Delta for guitar amps, or Aria for vocals, for example — but the Mercury is aimed at more general use out on the studio floor. And a studio mic this certainly is — it’s not really ‘one for the road’ as such. The continuously variable pattern, and lack of any deliberate tailoring in the frequency response, offer the mic to a broad range of applications and techniques. It has a great deal of headroom, on paper, yes, but perhaps even more so in practical use. It’s designed to be a ‘go to’ mic, the one you put up by default out in the studio — maybe the one you don’t really take down. It’s designed to be the overhead, the room mic, the piano mic, the acoustic guitar, the amp... or perhaps the main vocal. It’s supposed to take what you throw at it, to keep your options open, not to box you into a corner sonically. Its development was characterised by three years of extensive listening tests, and it’s designed to sound superb at all times. So... does it? If I had to pick two words that best describe the sound of the Mercury microphone, they would be ‘present’ and ‘transparent’. There’s a clarity here, a definition and coherence all the way from the bottom to the top of the frequency response. It sounds modern, open, solid and defined. At this point, it’s worth coming back to the subject of headroom. This is a mic with more apparent headroom than the specifications would suggest. Coley confirms this: the numbers are, he says, conservative, with several more decibels in hand. And so, as a drum overhead, this is a microphone that remains crisp and clear on the transients even without the use of the -10dB pad. This is a considerable advantage for a mic of this type; so often I find myself ultimately swapping a condenser overhead out because it just can’t cope with the louder sections of a track. I’m forced to go for a slightly different character as a result, but this microphone represents a legitimate option in this respect. On acoustic and electric guitars, that same definition and coherence yielded some beautiful recordings. Again the continuously variable pattern behaved almost like a tone control, moving the listener closer to the source as the omni became cardioid, closing out the room and increasing the proximity effect. A grand piano is an instrument with a complicated, harmonic high end and upper mid-range. If a microphone is peaky, a close position can often result in an uneven, confused presentation. Typically, you then need to pull back outside the instrument, away from the soundboard in order to minimise this ugliness. 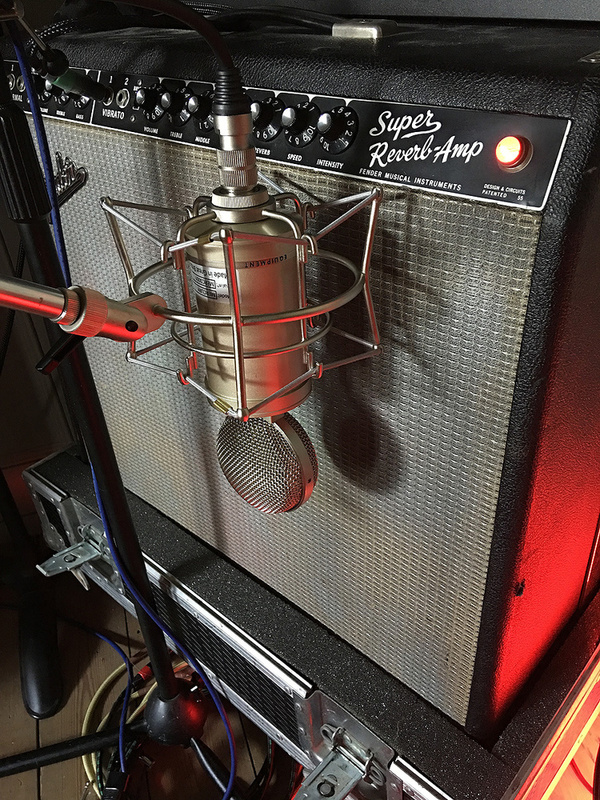 But in the context of a pop or rock recording, that might not be appropriate — often you might prefer to be ‘up close and personal’, perhaps with the lid down to the ‘short stick’, with heavy blankets or covers to increase isolation from other instruments in the room. Placing a pair of Mercurys in cardioid, as close as possible to the soundboard, I was able to achieve clarity and presence, without distracting, unworkable resonances. This is a testament to the quality on offer here, and it’s a trait that I noticed throughout my tests of the microphone. On the right voice it’s capable of stunning results — pulling the details out of darker-sounding singers, moving them to the front and centre of the music. But this isn’t a microphone tailored towards vocal use in the way that the Aria is. And neither can it be — once we accept the benefits of that extended high-frequency response, we must also accept that if, on a brighter voice, we go close in the way that modern genres often require, our recording is going to risk revealing an unnatural amount of ‘esses’ and fricative content. This is characteristic of almost all of what one might term ‘posh, modern’ microphones. It’s one of the reasons why old U67s, for example, are so desirable on vocals — they control the top end, by their nature, as does the Aria. And one of the things about old U67s, again as with the Aria, is that they could sometimes benefit from a greater degree of presence and clarity in other applications. As ever, it just depends on your source. I was able to achieve some beautiful vocal recordings during the review period — a degree of detail on a dark, delicate, almost mumbled vocal that other options, Aria included, were unable to compete with — but Sontronics have designed this mic to spend its time pointing primarily at instruments out in the studio, and it’s worth keeping this in mind if you’re buying blind. So that’s the limitation. It’s not really a criticism, more the illustration of an inconvenient universal truth in audio recording — the microphone is irrelevant without the source. In other words, if you need to record a variety of different sources, the chances are you’re going to need a variety of different microphones with which to do so. But I do have a criticism. The continuously variable polar-pattern control has markings screened on the casing, showing the pattern at three positions: hard left (at seven o’clock) for omni, straight up (12 o’clock) for cardioid and hard right (five o’clock) for figure-8. Considering the significance of stereo applications with a product like this, and that much is made by Sontronics of the near-identical nature of two examples of the Mercury, it seems to me that more in the way of a visual means of matching patterns between two mics could be important here. Sure, it’s fine if you’re going omni, cardioid or figure-8 — you can’t go far wrong — but in the intermediate positions it’d be nice to have a bit more of a chance at precisely aligning the two controls. I don’t really want to guess where 10:45 is in a dimly lit live room. Going a step further, a little dab of fluorescent paint in the groove indicating which direction the control is pointing would be a nice touch too. This design is not the worst offender at any budget in this respect. It’s something that a number of manufacturers could possibly consider, especially since with a continuously variable pattern control they’re not cloning the classic German designs of the 1940s and ‘50s. This is another extremely strong product from Sontronics. It’s a fresh design with a nod to classic form, rather than allowing itself to suffer the restrictive inhibitions of a clone. It also represents extraordinary value: as with previous Sontronics products, it doesn’t burn its budget on excessive cosmetic gloss, but preserves it instead for the components that affect how it will sound. You could buy a pair for the same price as a single mic of similar sonic quality. Of course the devaluation of Sterling plays a part in the way professional audio products now stack up on the Google ‘Shopping’ tab, but that’s not the only contributing factor. We’re coming to expect Sontronics to punch above the price range, and in this case, again, they do. If, just for a moment, we buck the trend for romanticising vintage equipment and consider investment from the standpoint of a professional with a job to do, a pair of Mercurys, an Aria, a handful of Solo dynamics and a couple of Orpheus condensers or Sigma ribbons and you’d have the basis of a mic collection that would stand tall in any typical studio session — and all for less financial outlay than a single eye-watering foray onto eBay. I’m not the only one to feel that way — Gary Barlow was the company’s first customer for a Mercury, and the latest Ed Sheeran record relies on an Aria as well as an assortment of other products from the Sontronics stable. This is, again, a product that puts its money where its mouth is. I might just do the same. There are a number of possible alternatives in terms of switchable- or variable-pattern large-diaphragm condensers. In this price range, products from the likes of Blue, Peluso and Telefunken all suggest themselves. I would however suggest that even if your budget extends further, putting more expensive options from Brauner, Neumann, or Microtech Gefell within reach, it would still be worth auditioning Mercury before making a final decision. As this microphone is so suited for use in the context of a stereo pair, is there a matched stereo option? Well, the nature of the tight component tolerance dictates that two models should be extremely close in sound and performance, if not identical. The wild-card here is the valve (the mic uses the same JJ valves as in the Aria). The frequency response plots exhibit a fairly typical sort of shape for a modern, large-diaphragm microphone of this type. Broadly speaking they show a relatively flat response, with a gentle high-frequency lift. In my experience, you can’t really draw any conclusions about the sound from these sorts of plots when taken in isolation. Sometimes you can see evidence on a plot for a characteristic you can hear when you test a microphone, but in general I’d caution against attaching too much importance to them. I’ve included them here for the sake of completeness, and if I was asked to summarise how the plots relate to the results on offer, I’d say they present no surprises. Superb sonic performance regardless of cost. Precise position of pattern control dial could be more obvious. In the Mercury, Sontronics have achieved new heights with yet another star that doesn’t cost the earth.